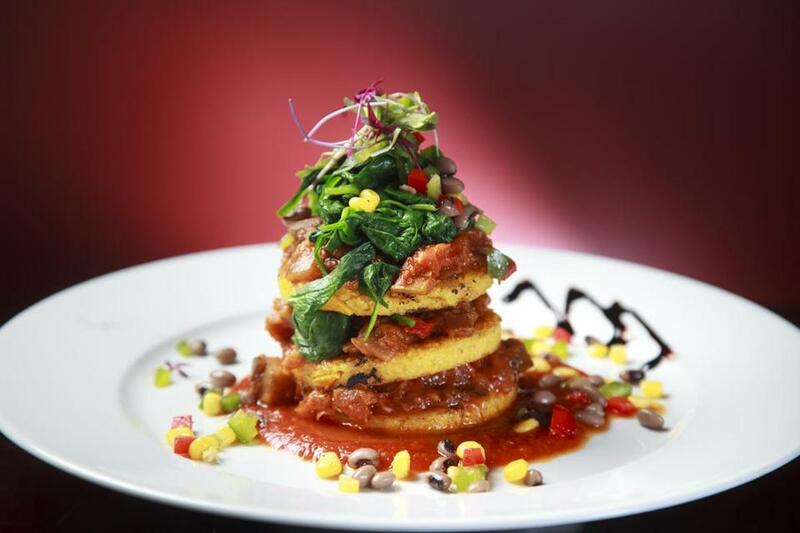 Walnut Grille specialties includes polenta Napoleon. Every table on this Saturday evening is packed with families. Parents appear almost giddy as they watch toddlers and preteens dig into dinner. No pleading, begging, or bargaining, at least not that I can hear. Walnut Grille, the new vegetarian restaurant in Newton Highlands that specializes in gluten-free dishes, including pizza and quesadillas (made with either vegan or dairy cheese), serves delicious food. Even our group’s dyed-in-the-wool carnivore declares this. Chef and co-owner Shiva Kumar attended culinary school in his native India, and worked in Seattle and New England kitchens before opening this upscale 45-seat place in March with four friends, Kannan Kesav, Kaarthy Madhan, Michael Stern, and Ashwin Parthasarathy. Housed in the former Christina’s European Cafe Bistro, Kumar serves cuisine he calls “global vegetarian.” Every menu item is clearly marked as gluten-free, vegan, available as vegan, even soy-free. Staff are trained to handle potentially allergenic foods with different utensils and cookware. If you think a veg-centric menu is bland, you’re in for a surprise. Butternut squash bisque ($4-$5), which seems to be on many tables, is a bright, velvety smooth bowl, full of umami flavor and unsweetened coconut milk. It comes with rounds of Iggy’s wheat baguette or house-made gluten-free bread. Gobi Manchurian ($8) is an ample plate of tender cauliflower florets dusted with chickpea flour, fried crisp, and slathered with a sweet-spicy tomato sauce. If this dish reminds you of the one served at Red Lentil in Watertown, you know your vegetarian restaurants; Kumar used to work there. We also love “drums of heaven” ($8), which seem like skewered falafel brushed with zippy chili glaze. By the time we think to ask for additional glaze for dipping, these drummies are all gone. Ocean salad ($8.50) features chilled soba noodles tossed with soy-marinated hijiki (an inky-colored toothsome seaweed) plus carrots, scallions, and sweet crunchy jicama on baby greens. 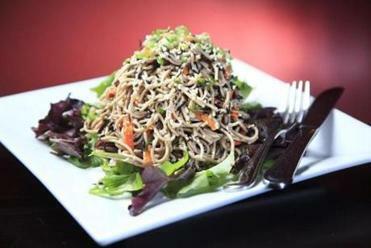 The salad is too lightly dressed, but the combination of cool noodles with crisp raw vegetables is refreshing. Gluten: fact or fad or a bit of both? A gluten-free diet is important to millions, but its significance may be overblown. Polenta Napoleon ($12) is a tall, riotously colorful dish with a saucy pepperonata (tomato, onions, and sweet bell peppers) layered between grilled corn cakes. This stack is nestled on pureed fennel “Bearnaise” and crowned with curly kale and a fresh salsa of corn and black-eyed peas. Bright green basil oil dots the rim of the plate. A dining companion whose T-shirt reads “Bacon makes everything better” takes a bite. And then another. “I’d eat vegan more often if it tasted this good,” he announces. The garden loaf ($13), made with quinoa and minced vegetables, comes in substantial slices that are feathery crisp at the edges, served on a tempeh Bolognese. 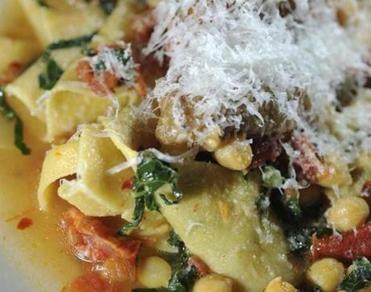 This Italian-inspired stew doesn’t in any way resemble the hard bricks of fermented soy you might have encountered at another healthful food emporium. A crisscross of roasted asparagus spears and a drizzle of balsamic reduction complete the presentation. We pop in for lunch on a weekday. Within the hour, the place is at near-capacity again, this time with well-dressed women in silk scarves. We order the smoothie special, a vegan mango lassi ($6) with silken tofu, which a lactose-intolerant dining companion adores for its sweet creaminess. Barbecued tempeh burger ($8) comes with choice of house salad, sweet potato fries, or tortilla chips. While I prefer my burger on a bun rather than gluten-free bread, my friend is happy and makes quick work of her plate. We want to end with the chocolate souffle, but the kitchen is out. The other ladies who lunch must have beaten us to the punch.